Maya de Wit, MSc offers sign language interpreting services, consultancy, research and training. Languages include International Sign, Dutch & American Sign Language, English, Dutch and German. Are you a sign language interpreter? Do you work sometimes or regularly with international sign? Please assist in this research and fill out the survey. The aim of this survey is to get a better understanding of the profile of interpreters such as you. Please feel free to share this survey with any interpreter colleagues you know are working with international sign. The survey is open from 1 – 30 April 2019. In February 2018 I started my doctoral dissertation (PhD project 2018-2023) on interpreting international sign at the Radboud University in Nijmegen, the Netherlands. The research is part of a larger project “Deaf communication without a shared language” conducted with Deaf and hearing researchers at the Radboud University. Sign language interpreters: Improve your English skills with this popular training! Is English not one of your native languages? Do you want to learn strategies and improve your skills when working with English and your national sign language? Sign up for the popular training “Interpreting from and to English as a 3rd language". Part I of the training will take place on 23 & 24 April in Utrecht, the Netherlands. If you have completed Part I you can also enrol in Part II, taking place on 25 & 26 April also in Utrecht. Combine your visit to the Netherlands and stay on for our national holiday King’s day on 27 April. After a successful two day training “Interpreting from and to English - part I” for sign language interpreters from Germany, Netherlands, and Iceland, we are making plans for more trainings in 2019! CIT conference presentation on "Educating sign language interpreters for multilingual conferences"
The Conference of Interpreter Trainers (CIT) held their conference in Salt Lake City from 31 October till 3 November 2018. It was a wonderful opportunity to give my plenary presentation on “A European panorama: Educating sign language interpreters for multilingual conferences“ and to meet educators, researchers and interpreters from across the USA and abroad. Sign language interpreters can use the rich knowledge and extensive experience of spoken language interpreters to become skilled in conference interpreting. In turn, spoken language interpreters can learn from the expertise of sign language interpreters. Ultimately, master-level conference interpreting programs should aim to develop a curriculum that will bring out the best quality for conference interpreters, whether signed or spoken. The 1st training on Interpreting for high level meetings and conferences was held in conjunction with the EUD seminar in Austria. Sign language interpreters from across Europe and from the USA participated sharing experiences and learning more from the field of spoken language interpreters. 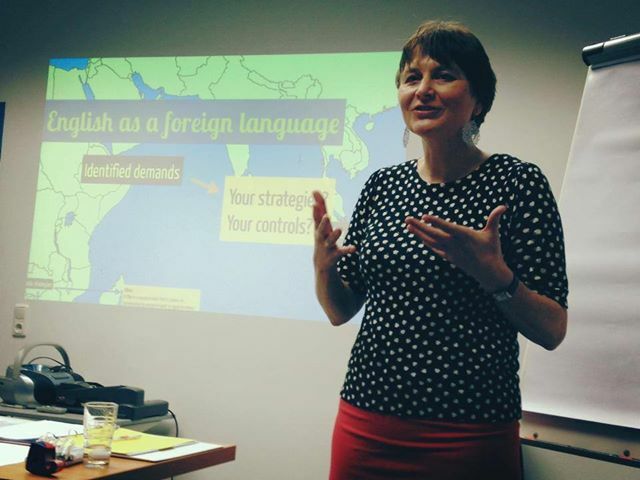 In October, STTF, the Swedish Association of Sign Language Interpreters, hosted part I and II of the popular Training ‘Interpreting from and to English as a 3rd Language’. As one participant said: “Interpreters have so many common experiences, even across borders!” These were again three trainings with amazing opportunities to share expertise, knowledge and experiences. Thank you to all who participated! Ready to join this popular training? In this Part I of the training you will learn new skills and strategies to interpret from your national sign language to and from English. The training will be held in Nuremberg, Germany, on 18 & 19 January 2019. Find here more info and registration. 'A Deaf Journey through Time' now available in English! First published in Dutch in 1998, 'A Deaf Journey through Time' ends up looking forward to a more promising future. As we have stepped into the 21st century, where technology keeps opening up new opportunities, it is even possible to imagine a world where Deafness is not an obstacle at all. For now, such a future might still be a dream but it is crucial to cherish such dreams. You can order your copy at amazon stores worldwide! Multilingual conferences and high-level meetings require different skills than sign language interpreters are often educated in. Come to the training in Vienna on 6 & 7 October 2018 and take the opportunity to practice strategies and discuss theories. You can combine your trip to Vienna and attend the European Union of the Deaf (EUD) annual seminar on Friday 5 October. The training and the EUD seminar will take place at the same venue. A sign language interpreter is the communication link between sign language users and persons who do not know sign language. Through professional interpreting services a deaf, deafblind or hard of hearing person can access employment, education, and daily life activities. The skills and expertise of each interpreter varies and it is important that the interpreter can meet the demands of the job and the client. I can provide interpreting services within a large range of skills and coordinate interpreters for event. Continuous education is essential for sign language interpreters. Interpreters can gain further expertise in specific settings, such as conferences, higher education or healthcare, but also enhancing their skills in areas such as teamwork, problem solving and ethics. I develop and offer trainings (inter)nationally specific to your needs and demands. The profession of sign language interpreting is rapidly developing. Educational programs, organizations and governments need to be informed of these changes in order to incorporate these best practices. I offer consultancy services ranging from reviews of programs to information on best practices on interpreting services and solutions for accessibility issues.